I get that you’re saying that it COULD be used as a concentration camp in the event of the breakdown of order in society, but you might want to make it more clear if thats what you mean. I know about the likelihood of that (its possible) and I have read the file you can download right off the UN Website “agenda 2030” and “21” so I am aware of a technocrat class which wants to empty rural areas and confine people to small areas in cities. Basically “Global scale communism to save the planet from Global Warming” That is very much a real worry. THAT being said… I have been to these camps and it is far from a concentration camp. First of all, these are coveted jobs, people are excited to be able to make this kind of money so quickly. They pay you more than some professionals make since its hard work and far up north, they feed you lobster and steak and all the best kinds of food there is, when you’re not working you can go see a movie or work out or go swimming or whatever you want. The reason there’s few if any cars is people don’t want to drive on the “highway of death” Alberta 63 it is only two lanes not twinned for the majority of the way, and its about 4 hours from Edmonton to Fort Mac, and then another hour or so north to the work camps. And sure, you work 12 hours a day, and sleep in tiny barracks, but you get paid like 2-3 grand a WEEK. often the work schedule is 10-14 days “on” and the same “off”, and you get bussed to the camp and bussed to work every day. And you have to follow orders or they’ll… Send you home! (thats not very concentration camp-ish). People go work “up north” in these camps for a few years and they own a house and have a 50 thousand dollar truck. Hardly the stuff of North Korean or Nazi German nightmares! THE PEOPLE get into the Suncore, Syncrude, are BUSSED IN! it’s their own little world over there folks, believe me, SO, NO these are not fema camps, it would be camp for employees, this is the way it works, the police don’t even get involved in anything that goes on in there, they do THEIR OWN POLICING, they are upgrading ALL the time, so they do have a lot of employees sometimes, ALL and most are from out of town, and most employees opt to stay in camp because it’s 6000 dollars to rent a house in Ft. McMurray, employees who work at McDonalds make over 20 bucks an hour!! I’m pretty sure that’s PTI Athabasca Lodge located just south of the “Bridge to Nowhere”. On Hwy 63 about 40 minutes north of Fort Mac. The trailers are built in Edmonton then trucked up there for assembly. These camps are pretty decent places to live while working far from home. The food is excellent, the buildings are expertly maintained,and the rooms are clean.. This camp also has a driving range, hockey rink , gyms and a bar. Tar sands or oil sands – it makes little difference. I believe initially, it was being called tarsands by the industry itself until the PR people decided oilsands sounds better. Either way, it’s bitumen extracted from the clay and sand that is refined to crude oil by plants such as Syncrude and Suncor or other “plants” just extract the bitumen for pipelines south for refining. BTW – Interesting fact:: It was once considered (and approved by the Alberta Government) to use nuclear warheads for mining the bitumen. The concept goes something as follows: A hole would be drilled past the overburden covering the bitumen soaked formation of sand and clay, then a nuclear warhead would be inserted and detonated. The thermonuclear reaction would instantly heat a very large amount of tarry, thick bitumen which could then be easily pumped to surface for processing. True. Given that I spent 12 years in Fort McMurray (Now considered the municipality of Wood Buffalo) I thought I’d add some information, since I spent 4 summers working for Suncor Energy I might be able to enlighten readers. First off “Tarsands” is an incorrect moniker promoted by environmentalists, and propagated by mass media. Just because you read that term online (like Wiki) doesn’t mean it is accurate. The industry is oil sands – the extraction of synthetic crude from bituminous sand. What you get from the ground isn’t tar bar, but more appropriately it would be called asphalt or bituminous sand. Yes, there is a distinction between the two. The size quoted is considered to be the total size of the deposits in all of Alberta. Only a tenth (I’d estimate) is considered recoverable by today’s technology. The media explodes the numbers when only a fraction of the land is actually being mined. Some of the oil sands projects no longer strip mine but use InSitu process (inject steam into the ground and then pump the oil in a more conventional fashion). 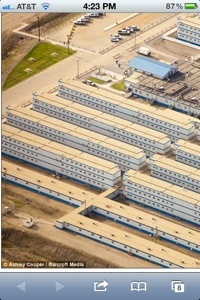 Great Canadian Oil Sands (GCOS) was the first viable long term commercial oil sands developer. They started mining in the late 60’s and they developed massive reclamation projects as part of their overall strategy. What often doesn’t get mentioned by the environmental lobbyists are the areas of reclamation, some of which have been reclaimed for a few decades. The primary environmental land use concerns are the tailing ponds, which can be quite large, but even with today’s technology they can eventually be reclaimed as well. As for the camps, as far as I know ATCO is still the primary supplier of camp infrastructure in the region. 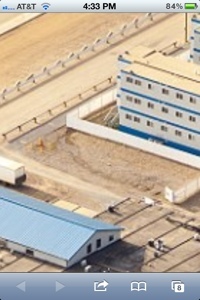 These camps are generally self contained and fenced for employee protection and occupational health and safety reasons. These camps in your photos are usually for the temporary worker population. A lot of these temporary workers come to Fort McMurray and don’t bring a vehicle. They work there for a number of months and return to their homes in other cities and countries. They can take company buses into Fort McMurray if they need supplies or wish to take in the culture *cough*. There are people who drive out to these plants in private vehicles but for security reasons they must park their vehicles in authorized locations on the perimeter and then shuttle buses run between the parking lots and the main plant sites. So usually what you see in pictures are authorized contractor vehicles, or vehicle and machinery owned by the oil company.